As of this date and writing, we have 168 good surveys. Almost all of them are submitted by people with relevant experience; 77% of the respondents have more than two years of work experience in the alcohol beverage field. The term “craft” has become crucially important to thousands of producers and millions of consumers in recent years. And yet it has no agreed meaning. We intend to change that within one year from launch, and fill the term with meaning in a fair, flexible, enforceable, modern way, to save it from abuse. 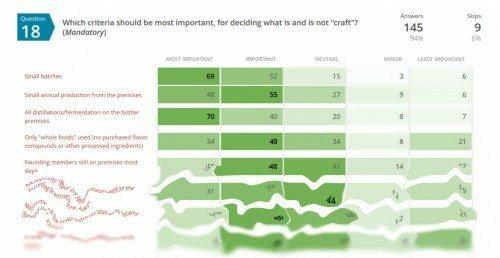 These surveys provide solid feedback on what the term “craft” does mean or should mean, in relation to beer, wine and spirits. If you have not yet completed a survey, and you work in the alcohol beverage field, please complete the survey here. We would like to have at least 500 responses before drawing any major conclusions. 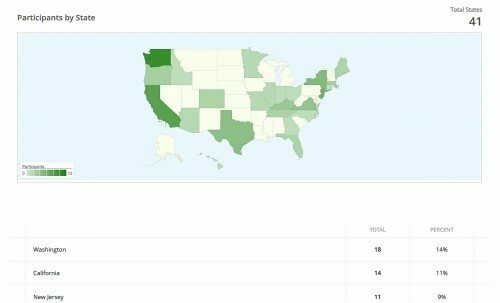 We are off to a good start, with 152 responses in the first week. The survey is sponsored by the Craft Beverage Association. 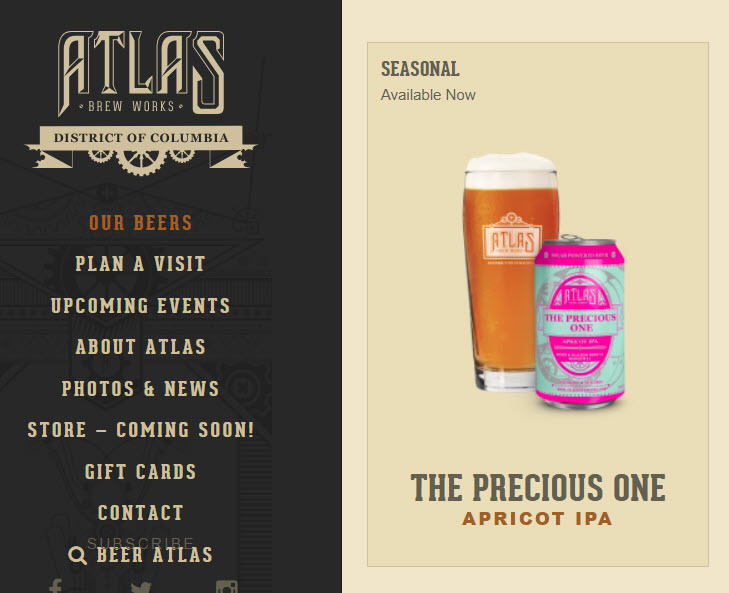 This is a Washington, DC-based non-profit trade association that seeks to define the term “craft,” within one year from launch, in a fair, enforceable and flexible way, to fill it with meaning and save it from abuse. We would certainly appreciate your help. Please use the comments below, and the survey, to get involved, or to let us know the very best people who can help. We will share the highlights on the Craft Beverage Association website, within a few weeks. But for now, we want to share a few excerpts from as below. Please note we will aggregate the survey data and keep it non-personally identifiable (like Google gathering traffic data) unless you clearly indicate a preference to the contrary (or we get your explicit permission). Based on the responses so far, it should take no more than 10-15 minutes to complete this thoughtfully. 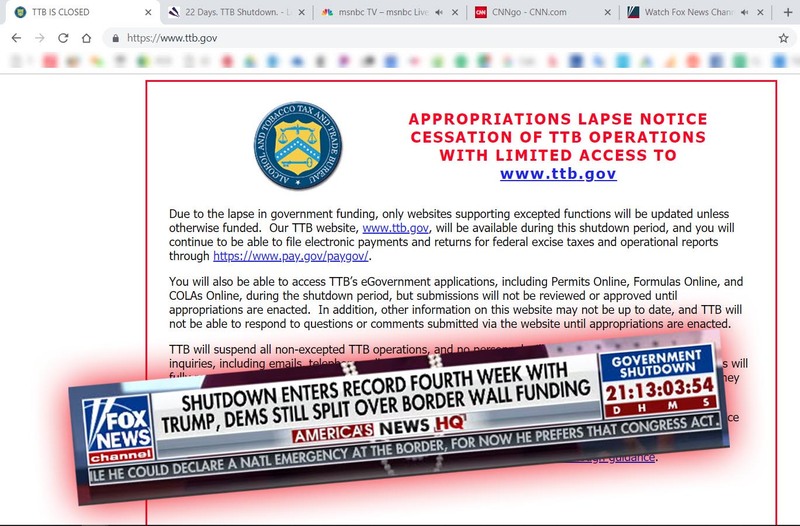 Many responses say TTB is in a good position to help with this. The responses also say that trade associations would be good. Though parts of this are surprising, we need more responses on this point because there were many skips. But this is encouraging because our plan would leverage the strengths of TTB and trade associations. Less surprisingly, a lot of respondents are saying that batch size and total annual production are crucial. Not so many respondents assert that the following criteria are at odds with true craft: a) no change to ingredients or method in many years; b) the bottler grew/produced a majority of the ingredients. 70% think the topic is important. 72% say they are more likely to buy a product marketed as craft and 60% say they would pay at least a few dollars more per bottle. 51% say they would like to help with this project. Washington distiller: Wow. Good luck with that. I mean that sincerely and without snark. I kind of think it’s like jumping into a shark tank with a sirloin in your shorts, but if you can get folks together on it, more power to you. California distiller: Without a meaningful definition that can galvanize everyone involved — makers, wholesalers, retailers, the media and the public — then craft beverage (liquor particularly) will become nothing more than a throwaway line. Most focus too narrowly on minuscule volumes and hobby level techniques without much regard for how customers see craft and what they’re looking for from craft made products. Am willing to help craft a new, better version with like-minded folk. This will create a level field and reduce the chances of confusion (or cheating)…assuming that craft can deliver on its promise to the public to deliver quality and innovation. If not — i.e., craft = amateur hour — then any small producer who makes decent products will run as far away from the term as possible. This is a tricky and touchy subject that will only get sorted out in time through a shakeout, but it’s important to discuss it openly. Montana producer with 8-15 years of experience: The term has very little useful meaning at this time. It has been diluted and there is no universally accepted definition, let alone an enforcement mechanism. Colorado brewer: We stir our mash by hand, turn every pump on/off manually, climb inside our kettle and tanks to clean and sanitize, etc. I would love to see craft have definition so that those who brew with robots separate themselves from those that brew by hand. Colorado distiller: I run all the mashes for my whiskey in-house. At the end of the day I’m picking grain dust out of my ears and eyes. That’s craft. Seriously though… it’s insanely hard to put words to, but I’ve heard folks propose that craft must involve substantial alteration of the initial ingredients for the sake of achieving a superior and/or interesting final offering. California beverage lawyer with more than 32 years of industry experience: It is a term of art that needs to be defined. Idaho producer with 8-15 years of industry experience: Putting “craft” on our packaging would be akin to a woodworker doing the same on a chair. It is unnecessary. Texas producer with 16-32 years of industry experience: The term has already been defined too broadly to be useful and it would be effectively impossible to narrow the definition now. The term no longer carries any practical meaning. Virginia producer with 8-15 years of industry experience: It is a term that is loosely used and I think lost meaning. Currently, are you more likely to buy a product marketed as “craft,” or more willing to pay more for it? Yes; I am a sheep. If TTB or another entity set out fair and enforceable rules for the use of this term (“craft”), would you be more likely to market your product as such, or to buy a product marketed as such, or pay more for a “craft” product? I do like rules and clearly defined lines. From a Virginia brewer: The most ridiculous excuse used by politicians to not make rules is that someone will take advantage of them. That may be true but there is no other choice in a society based on the rule of law. New Jersey producer with 16-32 years of industry experience: There is quite a lot of debate, it would be great to have a definition. Craft does not mean it is good or a good value. South Carolina distiller: For Jack Daniels, if they made a small batch product I do not see why they would not be able to market it as “craft”. I don’t think that they will though. 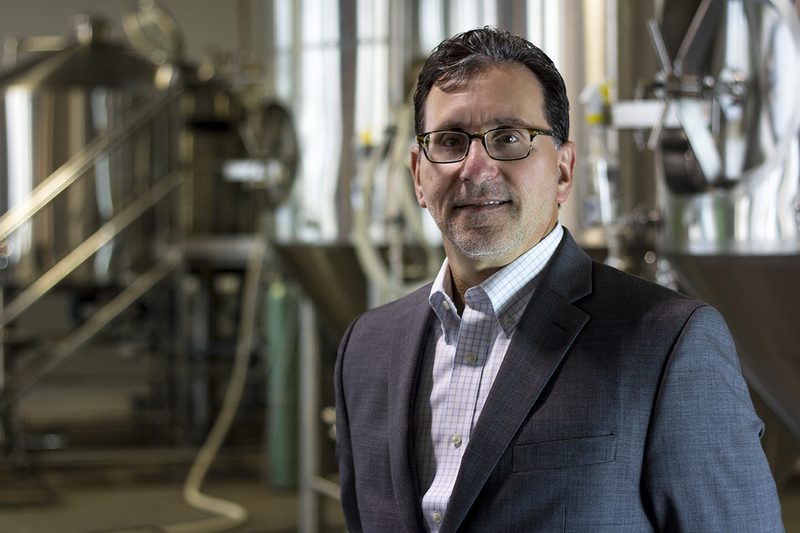 For Anheuser Busch, I believe they already make a craft product called Ziegenboch that is limited in production, differentiates itself from all other mass produced beers and is only available in Texas. And is delicious. Who cares about wine. Hawaii producer with more than 32 years of industry experience: We practice craft methods and believe in them. Craft methods are the kind of work that humans are engineered for. That kind of work is satisfying and enriching. The words should be protected so that the trade and the consumer are not misled. There is a lot of mediocre product labeled craft. Also, non-craft producers are using it. If the product was genuinely craft-made, why not? Gallo has made excellent small-production wine. E&J is better than most VS Cognac. California distiller: It’s really more about where the inspiration for a beer, wine or spirit comes from, the methodology used in making it and the transparency shown by the craftsperson. Too many people insist on size of production being a criterion, while I would argue that there are large producers making better products than many of those who would qualify based on size alone. Others would argue that the founder has to be responsible for producing every batch, which is like saying that the chef at a restaurant has to make every dish to qualify for their Michelin stars. When we first started distilling, the terms “artisan distiller,” “craft distiller” and “micro distiller” didn’t exist. [We were] a great, world-class distillery that just happened to be small. I’m willing to argue obnoxiously about this. Virginia distiller: It is an inherently difficult topic. The people at Jack Daniels, for instance, spend a great deal of time crafting their product, and make use of a good bit of automation in doing so. Who am I, Joe Littleguy, to say that they are not craftsmen any more than I am? Tennessee distiller: I think this craft thing is mostly a marketing trend. 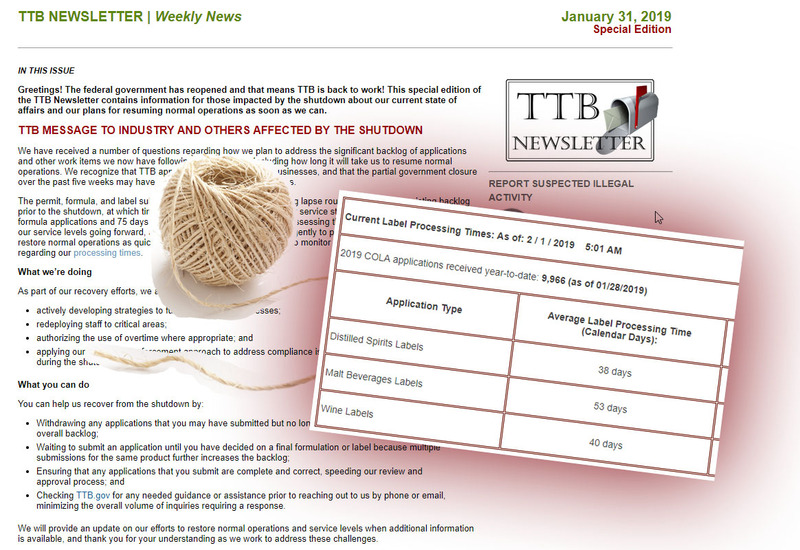 It is a bad idea to make legislation that will increase bureaucracy and make the TTB more difficult to work with based on current marketing trends. I’m a small producer and don’t see the need to explain to my customers that I make my product by hand. I think it’s pretty self-explanatory. My iphone is made by hand in China. Should that be considered a craft product? Colorado distiller: Please don’t let those with the largest pocketbook be the ones to define what Craft truly is. It will be a travesty to those who consider themselves craftsman, those who work with their hands and hearts to produce as high a quality and enjoyable a product as possible. Ontario distiller: Consumers enjoy authentic craft products because it gives them a connection to community and geography. If consumers grow to mistrust these misrepresentations, something meaningful will be lost. Please make sure to complete the survey and share it with knowledgeable people if you have not already.